At The Barn, we take our altars seriously. They are ALL gorgeous, no matter the style, colors, or level of detail. The altars in this post range from minimalist to super detailed, and rustic to bohemian! They include fluffy drapes, loads of candles, hanging elements, rusty tin and everything in between. One thing they all have in common: gorgeous florals, because what would a ceremony at The Barn be without them?! You guyssss, we still have MAJOR heart eyes over Whitney + Jimmy's neutral bohemian wedding from last fall. Their altar was hands-down one of our favorite details of their day, with its ivory and taupe streamers, green garland, and neutral flowers. It was boho, but also timeless. Every detail of this wedding was perfection, from Whitney's dress to the bouquets and from the cake to the amazing reception tables. Never forgetting this one! Rebecca + Richard's altar is one that we'll NEVER forget. The antique fireplace mantel was so appropriate for their timeless, classic theme, and the gold painted bottles with white candlesticks (and just a touch of peach florals) made such a gorgeous statement. The peach and white bouquets on top were just the icing on the cake! Ali + Lee's altar was simple and sweet... just like every other detail from their big day! It was draped with taupe fabric, with cascading greenery and blush pink flowers. This sweet couple requested a wedding that was, in the bride's words, "as laid back as we are." Although this was one of our most simple and minimalist weddings of 2016, it was one of my favorites! Every single detail was sweet, elegant and totally gorgeous. The perfect day! We loooove it when our couples ask for some type of hanging element in their altar, and we were crazy over the lanterns in Holly + Caleb's. The greenery and beautiful flowers (those wine colored ones! so pretty!) fit flawlessly with their wine-themed, fall wedding. This wedding had too many amazing details to name, but a few that you absolutely can't miss are the rest of their ceremony details, the signature cocktail display, the beautiful reception details, and the fabulous cake. Hatley + Charles had THE most perfect rustic fall wedding. Every detail was rustic chic perfection, and their altar, made from rusty tin and pallets and topped with florals in gorgeous fall colors, was for sure one of the most unforgettable details of their day. Leave it to our team to take a big ol' pile of junk and turn it into something jawdropping! Their entire day was super sweet and full of love. Alexandra + Zach's altar was ohhh, so pretty. It started with a simple ivory drape and two floral tiebacks... But that greenery is what made it extra special! A few of my personal fave details from this wedding: the bouquets, which consisted of rich fall colors, Alexandra's all-white bridal bouquet, and the beautiful, bold colors on their reception tables. Britney + Zach's altar was a DREAM. This is Pinterest goals right here! ;) A lush, fluffy organza drape and two HUGE white floral tiebacks. 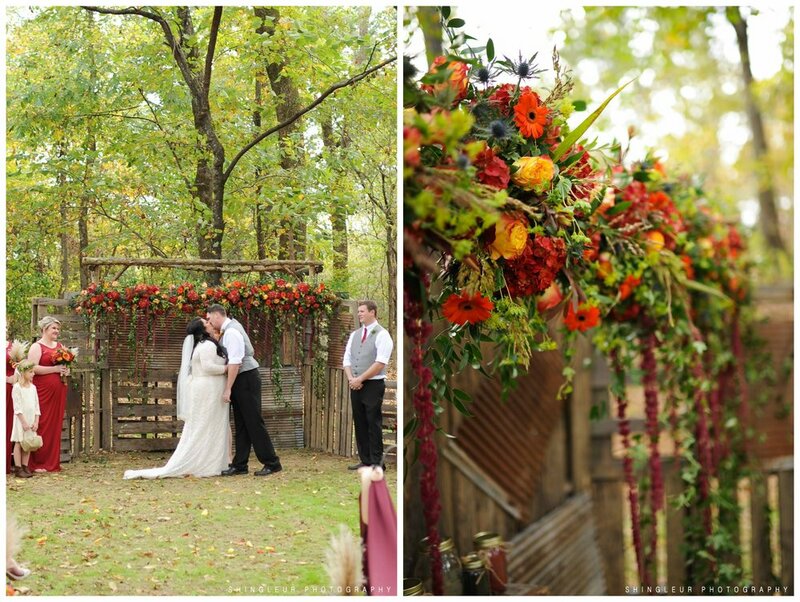 It was elegant and timeless, and I LOVE how it looked against the rustic backdrop of The Barn and the fallen leaves. Other fabulous details from this wedding: blue, orange and white reception tables and a super fun pretzel bar! Pam + Scott's elopement was full of purple and turquoise, with a "country bling" theme, as Pam described it. Many of their details were a little bit boho, like this altar with the prettiest turquoise and purple flowers. The mason jar chandelier on their altar was amazing, as was their cake table and the rest of their ceremony decor. Elopements at The Barn sure are sweet! Leah + Parker's wedding altar was very simple and minimalist, just like the rest of their wedding details. 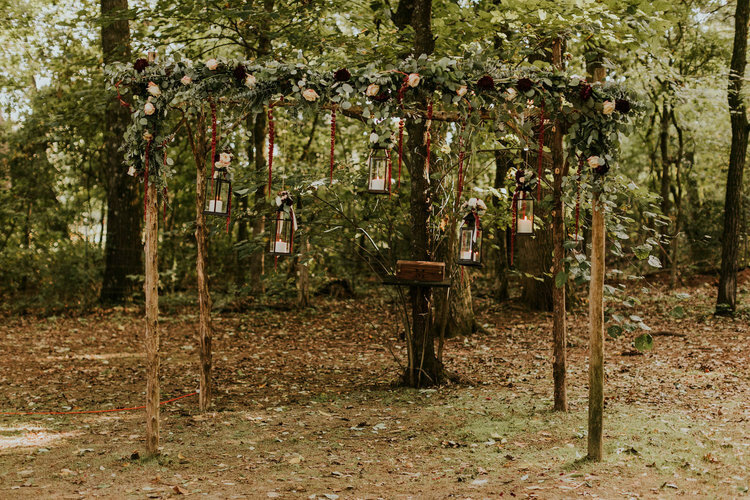 I love the burlap and small floral arrangements on the top of their altar, as well as the lanterns and wood accents. Their florals were the most gorgeous fall colors! This wedding was one of our most simple and understated, but it was still SO gorgeous! Finally, Rachel + Dalton were our first fall 2017 couple, and we cannot wait to blog their wedding soon! With an altar as pretty as this one, you know this wedding was a stunner!